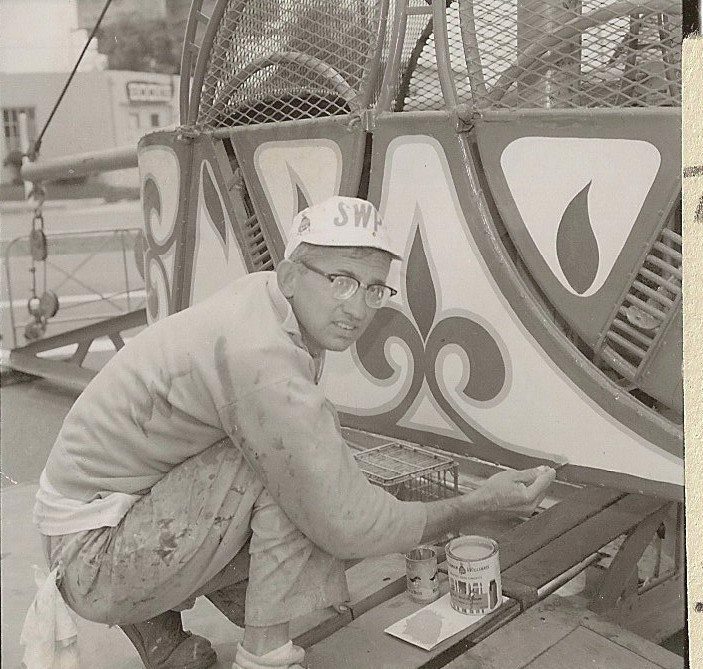 Show painters made the carnivals come alive with vivid colors and the artwork they created for the carnival midways. “Pollock” puts the flourishes on a ‘Crafts 20 Big Shows’ Loop-O-Plane tub. He painted on the west coast from the 1950’s until the 1970’s and did work for almost everybody including all the work for the Crafts 20 Big, West Coast Shows and much of the Carnival Time Shows as well as many others in their hey-day. Although the often eclectic show painters work was what made the shows of yesterday so colorful, most of these guys worked behind the scenes and their names have faded into obscurity. Carnival Show Painters created pieces of outdoor artwork. Old-fashioned fairground rides are still known for their elaborate decorations of brightly-coloured patterns and lettering. Traditionally these were painstakingly hand-painted – a unique art form that has been slowly dying out since its heyday in the Victorian era. But Joby Carter is one of the few remaining fairground signwriters who has eschewed machine-cut lettering and stick-on designs and still paints everything by hand. A perfectionist, Joby is passionate about his craft – and his ability to paint perfect lines and shapes without mistakes is mesmerising to watch. We, here at the museum would like to get as many of the real legends of the brush recognized and remembered. If you have some old photos of these guys, please tag them and put them up or send them to us here at the museum. Originals will be copied and credited and sent back if you wish.